Dean Koontz is one of my favourite contemporary authors, so it was a major let down for me to discover that The Eyes of Darkness was a disappointing read. The story begins with the death of young Danny Evans in an accident that also took the lives of many other school aged boys while on an excursion in the mountains. A year later, his Mum Tina begins to receive messages that say 'not dead'. Meanwhile, Tina meets a new love interest Elliot and together they try and untangle the mystery to get to the truth. The novel took a while to get going, with way too much emphasis on Tina's career, which later turned out to be irrelevant to the plot. I found Elliot's background and history way too much of a stretch, and their slow acceptance of the subtle supernatural theme quite frustrating. The book lacked the multiple plot lines and twists and turns of many of Koontz' more recent novels, and I discovered the reason for this at the end. In the Afterword, the Koontz writes that The Eyes of Darkness was one of six novels he wrote under the pen name of Leigh Nichols in the 80s. Now that Koontz is no longer using this pen name, he began to review and improve these earlier novels and publish them under his own name. When I purchased this book I found it in a bargain bin, and didn't realise it was a 'improved' version of an earlier novel, so I feel a little duped. Nevertheless, it was a quick read, and I was able to swiftly move onto something else. 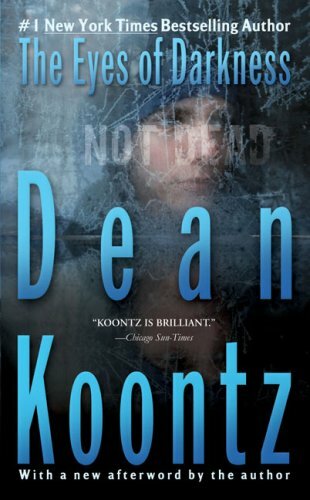 Unfortunately I wouldn't recommend this book to anyone; unless they are a dedicated Koontz fan who is keen to read every book in his repertoire. It's Dean Koontz. What else can I say. The suspense and the turn arouond ending are pure Koontz. This mother will leave nothing unturned to find her son, even when the evil ones are out to stop her. I'm glad to hear you enjoyed it.